The Affton High School cheerleaders march in the Affton Days Parade on Saturday, Sept. 16. Beautiful weather no doubt helped draw big crowds to this year's Affton Days Parade on Saturday, Sept. 15. The Affton Chamber of Commerce celebrates its Platinum Anniversary – 70 years – with this float in the Affton Days Parade. Children enjoy watch the Affton Days Parade from their wagon. The Moolah Shriners rode in the Affton Days Parade. Affton High School cheerleaders march in the Affton Days Parade. An Affton Days Parade participant hands out candy along the parade route. An Affton High School hockey player skates along the Affton Days Parade route on Saturday, Sept. 16. An Affton Days Parade participant stops along the route to interview parade goers. 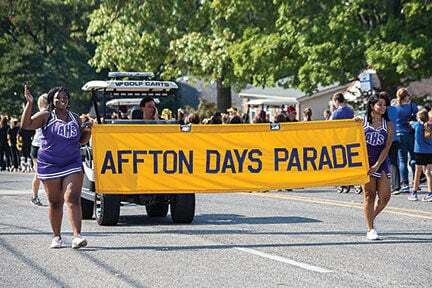 Members of the Affton High School band march in the Affton Days Parade. Members of the Moolah Shriners Motor Patrol participate in the Affton Days Parade. Members of Cub Scout Pack 725 out of St. Dominic Savio in Affton, part of Holy Cross Academy, took part in the Affton Days Parade on Saturday, Sept. 16. The Moolah Shriners show off some of their driving tricks during the Affton Days Parade. Members of the Bayless High School National Honor Society march in the Affton Days Parade. A military vehicle rolls along the Affton Days Parade route. Rogers Middle School cheerleaders march in the Affton Days Parade. 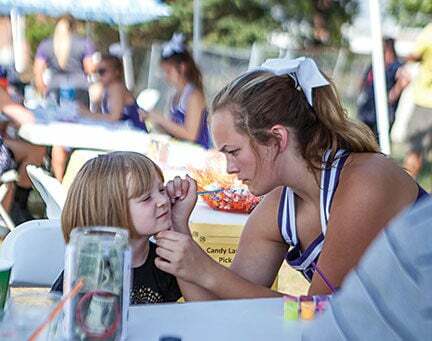 Affton Community Days & Parade was held Saturday, Sept. 16. The festival was held at Affton High School, which also served as the kick-off point for the annual parade. As in past years, the parade was sponsored by the Affton Chamber of Commerce. In this photo, the Affton Chamber of Commerce celebrates its Platinum Anniversary – 70 years – with this float at the Affton Days Parade.